Do you recognise this woman? 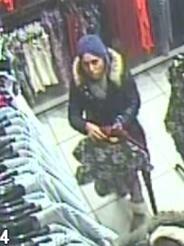 Officers would like to speak to her following the theft of a purse in Eastleigh town centre on Boxing Day. The purse, containing bank cards and £30 cash, was stolen from the handbag of a 67-year-old woman while she was shopping in New Look at the Swan Centre at around 10.30am. PC Gavin Smith from Eastleigh police station would like to speak to the woman pictured in the CCTV as she may be able to assist with the investigation. Anyone with information about the incident should contact PC Smith by calling 101. Alternatively you can call Crimestoppers anonymously on 0800 555 111.